When the Three of Swords appears in a reading heartbreak, grief, sadness and pain are suggested. The pain may be so intense you might feel as though someone has stuck a dagger through your heart. The suffering represented by this card is not confined to one area of your life so its presence can suggest anything and everything that cuts you to the core. It could be the loss of a loved one, illness, a separation or divorce, a broken friendship, family disloyalty, betrayal, a job loss, exam failure or even the loss of a legal case. In order to come out of this a better person it is important not to deny the pain or suffering represented by this card. Instead, you must live through it, experience the sharpness of it, let it wash over you and be patient with it. By living through the pain, only then will you know when you are beginning to heal. Time heals and this time of suffering will surely pass. As the Suit of Swords deals with communication this card can suggest a vicious argument or conflict between three or more people. It can also suggest a falling out between friends. Hurtful words from pent-up feelings and anger may leave you regretting what you said or you may be on the receiving end of insults and spitting remarks. There is bound to be a highly-charged stormy atmosphere and all involved will be tense and easily provoked. The Three of Swords can suggest that malicious rumours or gossip is spreading about you and you may be surprised to find out where it is coming from. Look for the reversed Three of Cups as those who are meant to be your friends could be happily sticking daggers in your back. The Three of Swords asks you to speak up and get to the heart of the matter for all may not be what it seems or what you think. Act now before you say something you might regret and before the situation gets any worse. If friends are involved then you are bound to be feeling very shocked and betrayed. Release is key with The Three of Swords. A great sorrow, usually rooted in the past, is often indicated with this card. Painful memories can be heavily repressed. The Three of Swords highlights the need to let go of old pains and hurts as they are bound to be affecting the present. It is a time to talk about them. Let all the associated sorrow flow through the tears that you have been holding onto for such a long time. It is important to experience the pain and grief of your loss or sadness. Express it, not repress it. You must open up and let it out before it poisons you from within. Allow yourself to forgive and be forgiven. Whatever is the nature of your pain, understanding and acceptance will come in time. It is The Swords Suit who live by the saying “What does not break me will strengthen me” for they have much experience of it. Patience is required of you now. The Three of Swords is traditionally associated with surgery or injury due to sharp instruments. This card also represented a nun. 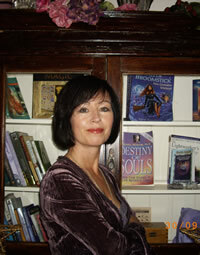 In a relationship reading The Three of Swords suggests heartbreak and conflict. Separation and despair could leave your heart torn apart. Partners, spouses or lovers part company under a tirade of abuse and hurtful accusations. Angry words and bitterness cause tears and great unhappiness. Years of pent-up grudges, bitterness and resentment spew forth in a tirade of ugly scenes. Communication may have broken down and dreadful misunderstandings may be at the root of the whole situation. There is an urgent need to be open with each other and to speak honestly and calmly about the grievances on both sides. Shouting and roaring will get you nowhere and you are bound to say things you do not mean in the heat of the moment. It may be hard to take back hurtful words and accusations once they have left their sting behind. There may however, be a third-party sticking their nose into a relationship by interfering and passing remarks. This could easily be a friend or family member who is jealous, possessive or just has a bone to pick. The Three of Swords can represent the legal battle in a separation or divorce. The third Sword can symbolise the Family Courts or Legal System. The third Sword can also symbolise a custody battle but look for supporting cards such as Justice XI in the Major Arcana and any of the Pages. The Three of Swords in a relationship reading can sometimes suggest an affair or love triangle but one must look to surrounding cards for supporting evidence. The Three of Cups reversed, the Seven of Swords, The Moon, Lovers Reversed or Reversed Court Cards may hint at such a situation but tread carefully. Maybe you are grieving for a an affair that did not work out. Maybe he or she told you they would leave their partner and it has taken a long time to come to the conclusion that they won’t. The disillusionment and waste of time may be overwhelming and a tirade of abusive angry slagging matches may ensue. The affair may also have been discovered (check for Seven of Swords reversed and The Tower) and is now out in the open. You may lose the support of family and friends. Your lover’s spouse may turn up on your doorstep and dramatic emotional scenes are likely to occur. Don’t do anything stupid. In a career spread The Three of Swords indicates unhappiness in the workplace or the shock of losing a job. Strikes and protests may have brought everything to a stop. There is bound to be a lack of communication between opposing parties which will lead to strife and recriminations. This card can suggest that you are caught up in vicious office politics and pettiness. Your workplace may be hostile with arguments and conflict among workers causing problems all round. Try to stay out of it all but be on the look-out for bully type behaviour. You may need to speak to someone in charge who has the power to restore order. Work can be a stressful place to be when this card appears. You may dread getting out of the bed each day. You might feel that you have to watch your back at work as colleagues put you down in order to self-promote. Great unhappiness in your chosen career may be indicated. Maybe your heart is no longer in your work and it is time to move on. 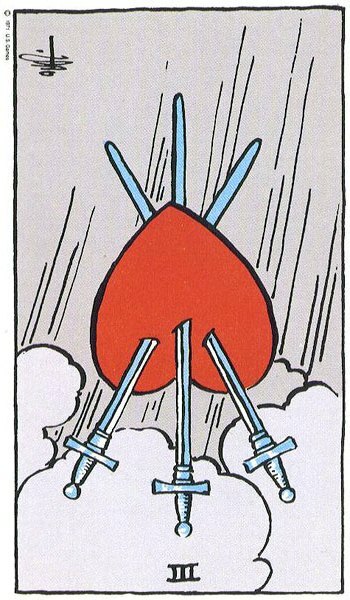 The Three of Swords in a career reading can also suggest working in a cardiac unit, grief-counselling, mediation and even acupuncture. With the traditional Nun association, it can also represent entering a religious order. In the reversed Three of Swords, the heart reverses and the Swords begin to fall out allowing much-needed healing to take place. The potential heartbreak suggested in the upright may not have materialised as a result of taking action. Through communication and compromise an unhappy situation may have turned around. As storms are known to clear the air, the clouds no longer dominate the background when this card reverses so hang on in there as you are nearly over the worst of it. You must be patient with yourself as you still have some way to go but it is a very positive indication that clearer skies are only just beyond the horizon. It may be hard to see any progress at the moment or you may feel that you do not have the strength to keep going but sometimes ‘the darkest hour is just before dawn’. Your situation is beginning to improve when this card appears reversed. The pain that has been acute for so long will weaken and the constant flow of tears will soon be a trickle for you have allowed your heart to heal. You have endured your suffering and now you can begin the process of recovery. When the Three of Swords reverses, quarrels and disputes between families and friends should begin to settle. You may have to accept your share of the responsibility and apologise. The door to communication opens and all involved are prepared to talk instead of shout. You may learn some hard lessons as a result of all the bitterness and anger. However, with the reversed, the other extreme can be experienced. The battle may intensify and there is a worry that things could really get out of hand. Emotional overload and explosive anger may trigger aggression or violence. Family feuds may become more intense and prolonged. The surgery needed in the upright may not be necessary, an alternative treatment may be found or spontaneous healing naturally occurs. 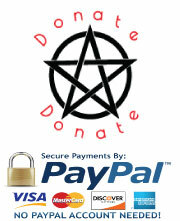 The flip side to this card is instead of allowing healing to take place one suppresses their pain and grief. Although you are engulfed with hurt, grief and sadness you may find it impossible to cry. The sadness and despair are internalised where they lie dormant inside, festering and deepening over time. These suppressions need energy to survive and they take this energy from the energy we have to live. This can result in depression, physical illness or even a breakdown. The pain eats us up inside as we deny our sorrow and can easily be projected onto others as we blame them for everything bad in our life. Counselling or therapy may be needed in order to open and release suppressed feelings and emotions. When this Three reverses, great loneliness can be evident and one can feel cut off from normal life. Mental confusion, and in extreme cases, mental disorders may be suggested. You may feel blighted with one trauma after another in your life. You may believe that someone has it in for you or that you have been cursed. In relationships, The Three of Swords reversed can bring reconciliation to a warring couple. Tired of battle and possibly on the brink of separation, the door to communication finally opens encouraging honesty, compromise and understanding. A rocky marriage or relationship can stabilise as partners learn to communicate their needs, likes and dislikes to each other. On the other hand you may be refusing to let the past go and are nursing old wounds. 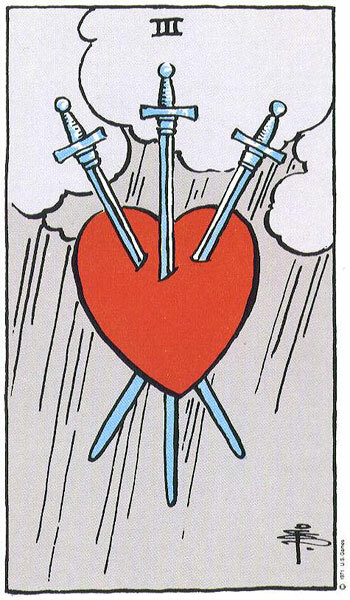 This reversed Three of Swords can suggest a separated or divorced person who refuses to move on preferring to stay in the past where they keep all the hurt and bitterness fresh. Nasty recriminating remarks that have gone well past their sell-by date continue unabated. Friends and family retreat, adding to the feelings of isolation and victimisation. The Swords are deeply embedded now and there is a refusal to move on. Unexpressed grief from the past may be causing problems for you in your relationship. This may result in you bringing unresolved issues and negativity from a previous relationship into your current one. If you have been badly hurt in the past this reversed card could suggest that you are avoiding relationships for fear of drawing further pain and disappointment to yourself. You must understand that not every relationship will dissolve into pain and hurt. You must learn to trust again and speak about your concerns. In relation to career all-out strike may occur if talks fail. Each side digs the Sword into the other where it will hurt the most. No one is happy in this situation. An unhappy working environment can become oppressive. There may be nasty comments from work colleagues and possible bullying going on in the workplace. Someone may have it in for you in work and is deliberately trying to make your life difficult. They may argue with you over every issue or pick holes in your work in front of others. Alternatively, an ongoing stressful situation begins to ease as workers drop their Swords and weapons and come to the table for talks. There is eventually an understanding that battle is futile and that compromises will have to be made on both sides. An unhappy working environment can change for the better due to the departure of a trouble-maker or the arrival of some fresh blood, releasing new energy all round. I really have enjoyed the interpretations..
And am glad of the reversed meanings..
Thanx for the insightful way the card meanings have been expressed! Thank you for your lovely feedback and sorry it has taken so long to respond. I am a one woman show and it takes some time to get through all my correspondence.